All rigid substrates are not created equal. That’s the philosophy adhered to by employees at Kalamazoo, Mich.-based Agio Imaging, a large-format custom print solution provider, when determining the best rigid substrate for graphic displays. When PVC (polyvinyl chloride) is deemed the best solution for creating interior signage, Agio Imaging turns to Sintra® graphic display board by 3A Composites USA. Sintra has been the industry’s leading PVC board for more than 20 years. This trusted brand is lightweight yet rigid and can be cut, shaped and formed to create unique designs. Durable Sintra cuts cleanly with smooth edges; and, it can be direct printed and accept vinyl graphics. Sintra fabricates easily without special tools; it can be heat formed and laminated to other materials. Agio Imaging often creates custom signage with Sintra that includes layered looks, routed shapes and exposed edges that are custom painted. Agio Imaging recently has turned to Sintra graphic display board – supplied by the Grand Rapids, Mich., branch of distributor Laird Plastics, Inc. – to create a wide range of interior wall signage including wayfinding signage, corporate departmental designation wall décor and school educational signage. While wayfinding signs serve a practical purpose, there’s no reason their design has to be basic. Agio Imaging created a custom look for the culinary services department at Michigan State University in Lansing, Mich., by incorporating school colors on two layers of Sintra as well as routed shapes and custom painted edges. Agio Imaging chose 12mm Sintra in the Dark Green color for the sign’s base and utilized a super-wide format UV printer to direct print directional information. The base was topped with a CNC-routed semi-arc shape, and its exposed edges were custom painted dark green. 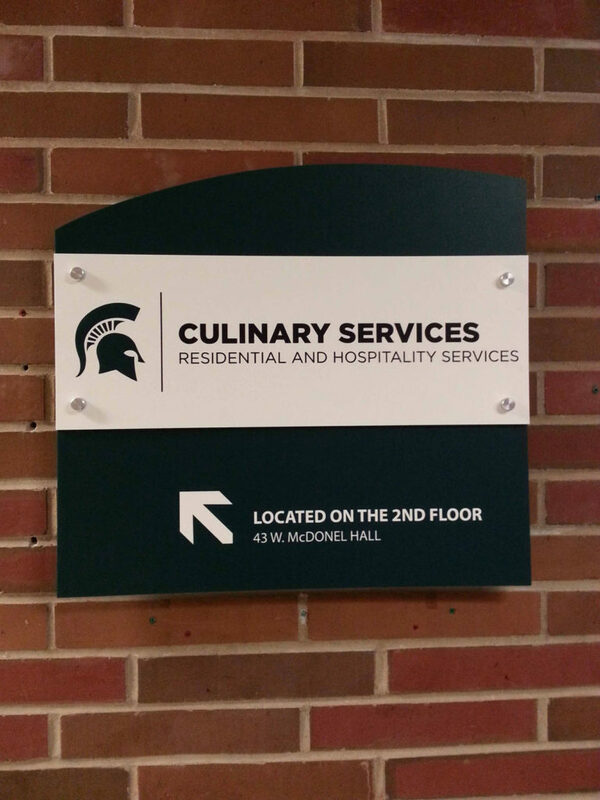 The wayfinding sign’s top layer was direct printed with a Michigan State Spartans’ mascot logo and departmental designation with green ink on 6mm Bright White Sintra and CNC routed with an exposed edge. Stainless steel standoffs were utilized to attach the two layers to each other as well as to secure the sign to the wall. While designating a corporate department easily can be achieved with traditional printed signage, Agio Imaging routinely steps up these designs with custom looks. A recent wall display designed to designate a corporation’s retail research department featured multiple routed elements from Sintra graphic display board – including cutout letters and a series of variably sized and direct-printed circles. Agio Imaging selected 12mm Sintra in the Dark Blue color to CNC route individual letters spelling “innovative” in a lower-cased contemporary font; the letters’ exposed edges were custom painted dark blue. 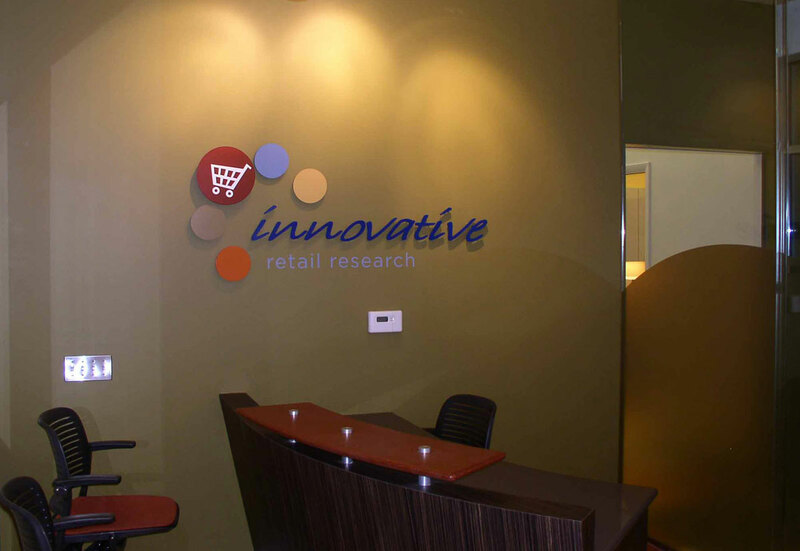 The cutout letters were dimensionally mounted to the wall with the words “retail research” printed and cut from self-adhesive vinyl installed beneath. Five circle elements completed the departmental design. One large red CNC-routed circle element featuring a white shopping cart image was direct printed on 12mm Bright White Sintra. Four smaller CNC-routed circles were direct printed on Bright White Sintra – two in the 12mm thickness and two in the 6mm thickness. The circle elements were finished with custom painted edges and dimensionally installed on the wall. Agio Imaging utilized a super-wide format UV printer to direct print the circle elements. 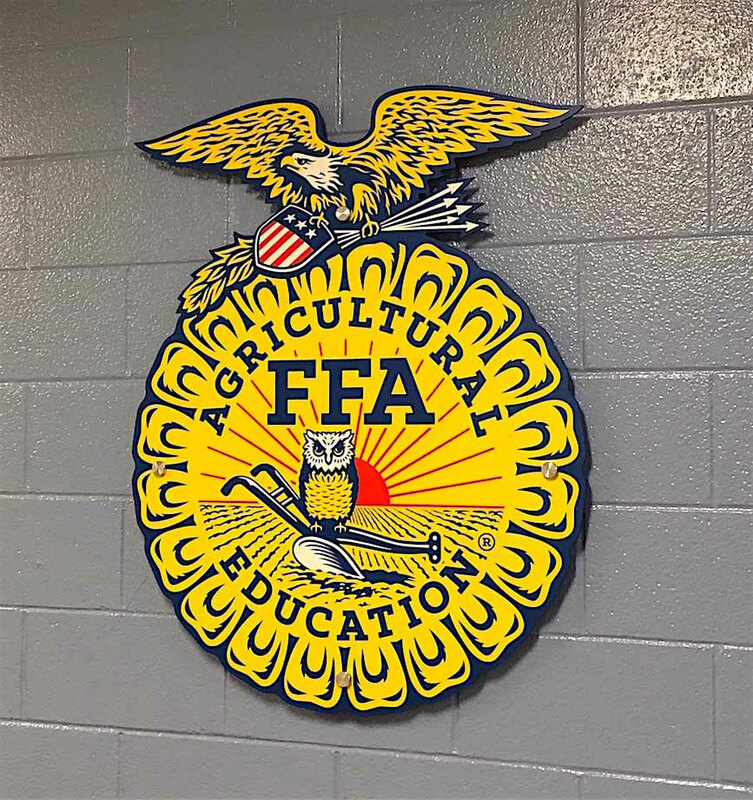 Agio Imaging turned to Sintra to reproduce the National FFA Organization’s logo – a large shield topped with an intricately routed eagle and arrow elements – designating FFA Agricultural Education at Maple Valley High School in Vermontville, Mich. The bright logo – featuring yellow, red, white and blue colors – was direct printed on 6mm Bright White Sintra with a super-wide format UV printer. Exposed edges of the CNC routed logo were custom painted dark blue. The finished logo was direct mounted to the wall with stainless steel fasteners.